This investigation provides a hands-on way to observe what happens when a chemical moves across a semipermeable membrane. In this case, a cheap plastic bag serves as a model for the cell membrane. Place a starch and water solution in the bag and then place the entire bag into a beaker (or cup) filled with iodine. In about fifteen minutes, the contents of the bag will turn purple. Students are tasked with developing a model for why this happened. They learn what and “indicator” is and why the bag turned purple, but not the contents of the beaker. This is also a good place to talk about the nature of matter, and what appears solid may not actually be solid. Iodine molecules are tiny enough to pass though these molecular spaces. A final question asks students to imagine what would happen if the experiment were changed so that iodine was in the bag and starch was in the beaker. You can set this experiment up as a demonstration so that students can determine if their prediction was correct. 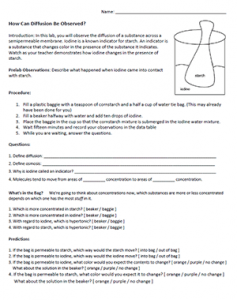 There is also a simpler version of this lab for Introductory Biology.